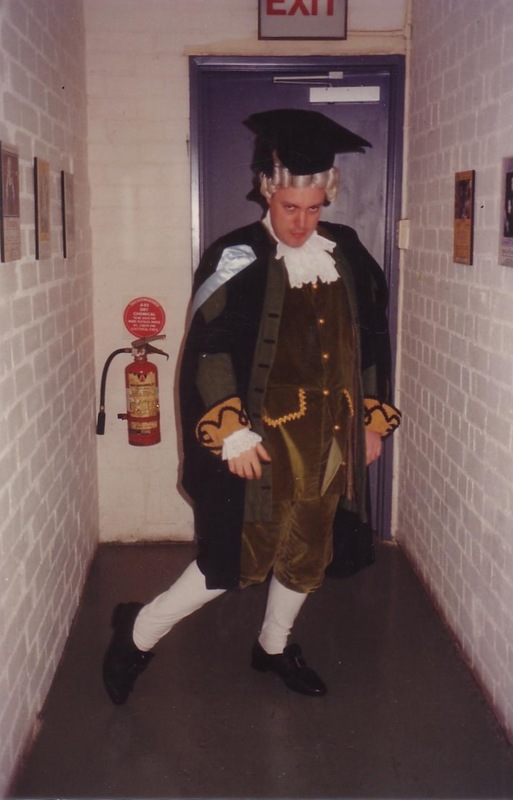 The impending Opera Australia production of The Barber of Seville has reminded me of when, in 1992, I was one of three musicians in a production of the original play by Beaumarchais at the Marian Street Theatre at Killara on Sydney’s North Shore. The above picture is of me camping it up backstage. I had graduated in law that morning, so I donned both costumes at once for the photo-opp. Other characters were written out, some of them in the course of rehearsals as the director, Peter Kingston, realised that we musicians were not up to the job. Two of us had a walk-on role for the denouement: I played the notary who solemnizes the wedding at the end of the play (and is hence indispensible). Until we slipped around to the back of the set for the final scene, we musicians sat at the side of the stage for the entire performance, wigged and stockinged in period garb (as you can see above): Sally, the flautist; John Reichard, cellist; and me, pretending to pay harpsichord on an electric keyboard (the most unsatisfactory part of the arrangement). There were musicians because the play includes a number of songs. The Count, disguised as Lindoro, serenades Rosina and later insinuates himself into the house of her jealous guardian on the pretext of giving singing lessons. The music was specially composed by Stephen Rae. In addition, in a kind of backwards tribute to the opera, I had to improvise Rossini-esque quasi-recitative accompaniments under the numerous soliloquies and occasional pieces of action. It was a pretty amazing experience, working with a bunch of very interesting and funny people. Amongst this crowd Jacqui McKenzie was the most subdued. She might just have been tired: for most of the run she was also filming Romper Stomper. We did 8 performances a week from Tuesday to Sunday with two shows on Saturday and Wednesday. The Wednesday matinee was at 11 am and was always the hardest. At the time I was attending College of Law 9.30 to 3.30 daily at St Leonards and also had some music teaching work at the school where I had been teaching part-time when I did my law degree. I don’t think I would have the strength or stamina to do so much today. I had to wag class to do the Wednesday matinee (“wag” is the appropriate word because College of Law was very much like school), except for one unavoidable assessment task where the Stephen Rae (who is also an actor) took my place. I was a little miffed to be told how much funnier he was than I. But it shouldn’t have been surprising that he was. One of the most instructive aspects of this experience was the moments when, at the end of the play, I was centre-stage with the actors, and could experience up close their quivering with larger-than-life comic charisma. We musicians were inevitably pallid by comparison. The play was not a runaway success. Eighteenth century-comedies, even if abridged, tend to be wordy, and the comic plot is, to modern tastes, fairly trivial. This inevitably had an effect. At one point midway through the run our stage manager, Libby, gathered the cast together and delivered a little “get your act together” speech about how things were slipping and that she felt it had reached a point where people might notice it out front. I wondered if she had been taught this this as part of the stage managers’ course at NIDA. Towards the end of the play there is a storm scene. This is a famous instrumental interlude in Rossini’s operatic adaptation. We had a backstage wind machine, and also had to improvise suitably manic music. To add to the wildness I had prerecorded (as you can on an electric keyboard) part of the music to which I would then further add in real time. Imagine my surprise one night, when I pressed the button out came The House of the Rising Sun. Imagine how shamefacedly Libby confessed that, fiddling around on the keyboard in the course of the day, she had been responsible for this. Most nights John Reichard, the cellist, gave me a lift back to the city. Since we sat through every performance (there were 58 in all as well as the preceding rehearsals) our conversation on these trips inevitably became infused with dialogue from the play. It is amazing how a play can furnish lines for every occasion. One of the classical admonitions to musicians and I suppose to other performers who might be tempted to treat a performance of a familiar work with less than total respect is to remember that you never know who might be hearing the work for the first time. I recently read in our local rag that some young up-and-coming actor determined to tread the boards after being taken to Marian Street as a child to see Bruce Spence in The Barber of Seville. Of the three musicians, Sally was possibly the most proficient. John’s playing could be very variable. This seemed to relate to fluctuations in his temperament. He had a rather unusual appearance, having had in his teenage years some primitive and radical brain surgery. He also had some infirmity in his legs which may have been from a childhood soccer injury. His career in music was a latish-in-life one and it wasn’t going so well. He had not been re-engaged for a scratch orchestra which from time to time gave concerts at the Opera House. Early in 1994, just before Francis Giacco’s Homage to John Reichard won the Archibald Prize, he hanged himself. I dedicate this post to him. You are currently browsing the archives for the John Reichard category.